Chlorophytum (Spider Plants) are native to South Africa. Beautiful houseplants and easy to grow, Chlorophytum are one of the best natural air filters for your home. Attractive leaves grow to 2 feet long with pups (new plantlets) hanging from mature plants. Just pluck off the pup to start a new plant. Your customers may like Chlorophytum because it’s hard to kill, so it’s an excellent starter plant for new gardeners or those lacking a green thumb. Chlorophytum likes living in a pot, it doesn’t mind drying out between waterings, and it enjoys cooler temperatures, down to 55 degrees. For best results with Chlorophytum, we recommend using a well-drained soil with a balanced fertilizer and a constant feed program of 200 ppm N. Maintain a pH between 5.5 - 6.5. Chlorophytum do not require pinching. 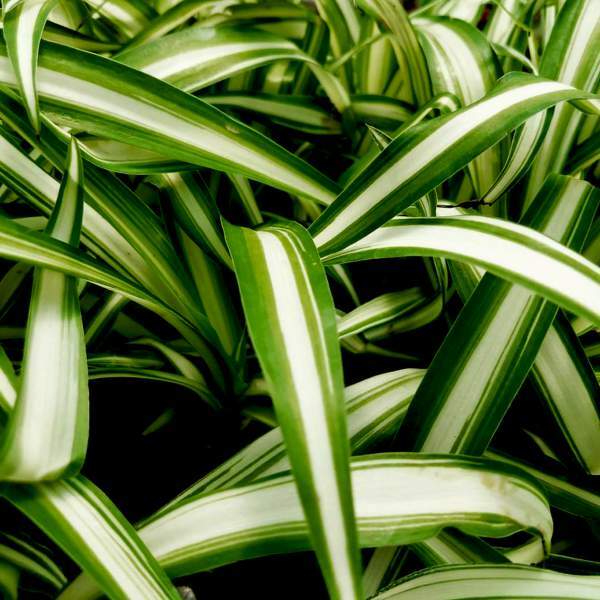 Chlorophytum should be spaced adequately to allow airflow and light penetration between the foliage. Usually 2’ centers on baskets will be enough. Plant growth regulators are unnecessary with Chlorophytum. Chlorophytum do not generally attract pests, but watch for whiteflies, mites, and mealybugs. Spider Variegated are not prone to many diseases, but watch for botrytis while the days are short. This grey rot is usually associated with wet or humid conditions. You can prevent botrytis by allowing the plant to dry out between waterings, allowing for good airflow in your greenhouse, and spacing to allow the sun to penetrate to the soil level. The most common chemicals used to treat botrytis are Medallion and Banrot. Use them as a drench according to each label’s instructions. We recommend planting 3 starter plants per 10 inch basket. Use a well-drained soil in your baskets and plant your starter plants deep, allowing the ellepot to be completely covered by the soil. If you are planting 4” pots, 1 plant per pot should be sufficient. Plant it directly in the middle of your pot. No pinching is required. Watch these plants grow and delight your customers!